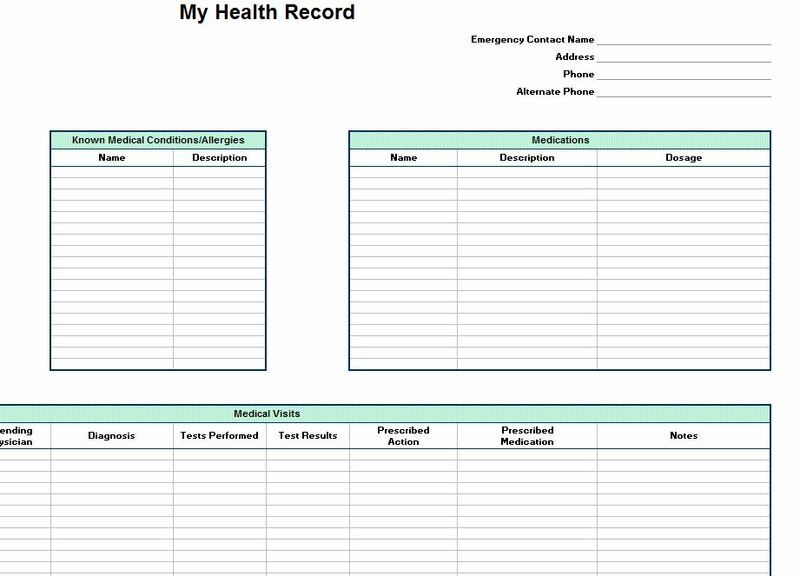 Keep a record of all medications, Dr. appointments and medication time schedules with the Personal Health Record Template. Maintaining a healthy body sometimes requires a patient to take multiple pills, using an organized way to record the amount of medication, its dosage and the names. Any surgeries can also be listed and when they happened. A personal health record template is a diary in scheduled form that records notes on medical necessities. A patient may note nausea after a period or a headache. This information may help Doctors or care givers administer better medication levels increasing the chance of a patient to gain better health. In some cases without a recorded instrument a patient can forget or lose track of medications taken and times. If information is recorded systematically there is less chance for mistakes. A personal health record template helps keep information in one spot. Medical information can easily be scattered. If you should feel ill it is not always convenient to try and tell someone everything you have taken in the past. Pointing to one source is easier for everyone and faster. The easy to use personal health record template can be used by patients and the information is accessible to anyone the users designates. This is a great way for Doctors and concerned parties to know how much medication a patient has taken and what time it was administered. This is a free download on this site. This product is an easy download and can be customized to fill your personal medical needs. If you have a special list of medications add them to the customizable setup. This data is filled out in easy to use slots. You decide how many slots and what is placed in them. The personal health record template sets up easy data backup information. A copy can be made for other concerned parties if that is the desire of the user. Password accessible but emergency teams can access important information without a password. Providers can offer better assistance with more accurate information.